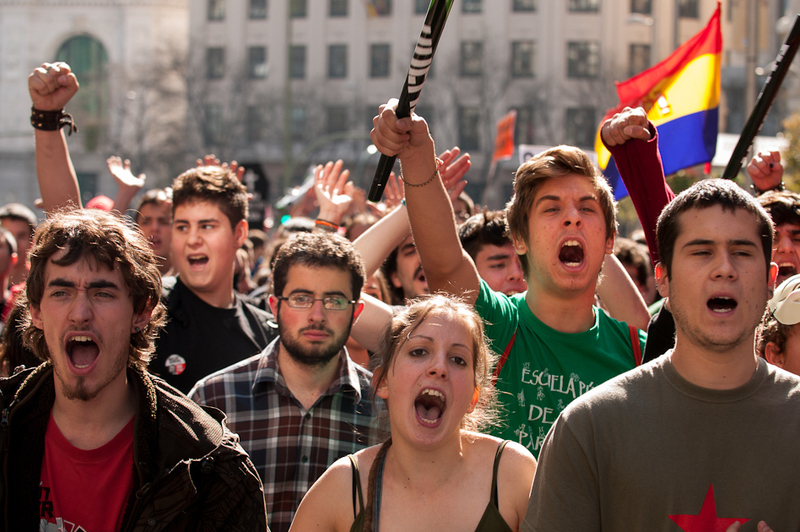 Young protesters take over the street during General Strike, March 29, 2012, in downtown Madrid. The Millennial Generation is the most giving generation compared to previous generations. Which is astounding, considering the generation has been pegged as lazy and entitled. Yet, it is these lazy individuals who are the back bone of non-profit organizations all over the world. However, it is not exactly the organization that millennials care about, it is the issues people face in the world today. Millennial’s realize that change is needed not because they are told to; they understand change is vital and it needs to happen now. Above and beyond the banality they face, Millennials’ know what they are doing is working. The numbers and the people who are helped by their action are the voices in defense of the millennial stereotype. Here are just a few of the non-profit organizations the generation supports. One in eleven people on this planet do not have clean water, people did not ask to be born into poverty, or born in to a situation where their basic human needs could not be met. Charity: water provides fresh water wells to those who do not have them. For about 30 dollars per person, the charity provides rain water catchments and sand filters to those who need them. The average age of a person who is using Charity: water is 33-years-old. Charity: water furthers the cause in a uniquely millennial oriented way, it tells stories, posts pictures of those who need to be helped, are being helped, and those wonderful individuals who help fight for clean water using social media. Not only is the millennial generation doing all that, they’re giving other people Ideas on how they can do it too, as a family and as a community. Rachel Kaufman is an operating room nurse, each day she does her job with limited resources and in a very tense setting. In her blog, she states it takes strength and flexibility to work in this type of setting. You see, Rachel is not your typical operating room nurse, she is stationed in Bouar, Central African Republic. Rachel, along with many others of the millennial generation all over the world, is part of the Médecins Sans Frontières (MSF) organization also known as Doctors without Borders. MSF brings quality medical care to people caught in a crisis, regardless of race, religion or political affiliation. MSF operates independently 90 percent of their overall funding comes from private sources. Over 65% of its people are millennials. Currently a large amount of their work is also with the Syrian Refugees. Millennials are not only concerned with the quality of the products they are buying, but also where the product came from. Especially if it is an animal product or a product which has been known to be tested on animals. People for the Ethical Treatment of Animals (PETA) is the largest animal rights organization in the world. Millennials’ often buy products that have a positive impact on society and the environment. When it comes to animal testing, PETA endorses Method cleaning supplies and LUSH cosmetics to be eco-responsible. Is it any wonder these two products are a staple in millennial homes. In 2013 TIME magazine was quoted stating that ” Millennials are the Me, Me, Me generation.” Yet the numbers of people who are the backbone of these organizations tell a different story. What motivates a millennial is the desire to affect their causes through an organization with their friends. Innovative organizations like Cause: water have discovered how to do that by operating in conjunction with technology, transparency, and hands on activity. Millennials are showing future generations their unique, individual perspective, and encouraging them to show who they are and how much they care by finding new and fascinating ways to donate to a cause. This article was written by Laurell Morse, a writer for dusk magazine. In the past, I have held jobs as an artist, personal care attendant, cashier and even a shoe saleswoman. The best job I have had the pleasure doing is being a mother, its full time and the pay is always wonderful. The payoff is not in green but in something far more valuable, the satisfaction of a job well done and the love of doing it. From there, I decided to continue my education. I went back to school and currently working on my BA in Psychology with a minor in English and literature. I think the “lazy” reputation comes from the fact that technology has made life convenient for our generation. It’s the equivalent of people from the 19th century being called weak because they were the first generation to have vaccines and not die en masse as a result of preventable diseases. There really is no basis in fact for this stereotype because what other generation has faced such a financial crisis since the Great Depression? What other generation works at Starbucks despite having a graduate degree? What other generation has paid so much of their income towards education & health care? All while knowing things may never get that much better since the wealth gap just keeps getting wider.